I have been much affected by reading the world news of late, especially that coming out of Israel and Palestine. As Laurie Penny wrote in the New Statesman last week, “the abused sometimes go on to abuse others”—and I, whose Sephardic Jewish ancestors have literally traversed the globe over the last half-millennium while fleeing persecution, am complicit in the cycle of abuse which the Israeli government is continuing to perpetrate on the Palestinians it in turn expelled from their homeland two generations ago. (On the New York Review of Books‘ blog, Hebrew University professor David Shulman offers frightening, vivid detail as to just how eerily right-wing extremists in Israel echo the rhetoric and the actions of their own ancestors’ abusers.) Meanwhile there are the right-wing parties who gained a moment of credibility in May’s European Parliament elections; and there is the violence in Ukraine and the escalating tensions between the US and Russia, and the pervading sense that none of us in any country is governed by politicians who could be trusted to resist the temptation to send young men and women to die in the name of misplaced ideologies. Maybe I’ve been reading too many World War I retrospectives. But things right now seem an awful lot like a powder keg, and I am moving to New York and getting on with adult life, and I feel obliged to ask what it means to be a Jew who feels morally obligated to speak out about what the UN leadership has begun to allege are Israel’s war crimes, and what it means to be a young adult growing up now in an ever-violent world into which inheritance, it seems, I am slowly entering. Sure, donating to UNRWA, the only agency currently able to offer water, food and shelter to displaced and persecuted Gazans is one thing, and we should all be giving what we can afford. But we may need to start asking ourselves whether the urgency of the situation, and our own moral convictions, demand that we do more. When I was five years old I, as family legend has it, “stopped the battle.” I know I’ve written about this before, or told the story to many of you: when my knights/chivalry/”medieval”-themed Montessori summer day camp tried to stage a “battle” with cardboard swords as an end-of-session party, and five-year-old me refused to participate, made a speech about how war was wrong, and shut the whole thing down. In some respects it is still the bravest thing I’ve ever done, and certainly the only piece of civil disobedience I’ve engaged in that has actually made a difference. I think back on it now as I think that my convictions impel me to do more than donate to UNRWA and post endlessly on Facebook about violence and persecution. I am searching for answers about what to do (and whether anything I could do would really help) and how to be brave enough to do it. In searching the internet for morally absolute language from faith traditions about the strength and significance of pacifism, I came across a compelling document published by the primary organization of the Society of Friends in Britain. In a book which outlines the central tenets and practices of the Quaker faith, it describes through primary documents from the seventeenth century on the Quakers’ commitment to nonviolence and conscientious objection. The inspiring stories of Friends who laid their lives and liberties on the line in the service of peace transcend the particular professions of faith that impel and sustain them in doing so. And they record the contributions of pacifists to campaigns for nuclear disarmament, for peace and reconciliation in Northern Ireland, and other modern causes that show that it is possible to do more than just to accept the status quo as an inescapable cycle of abuse and violence. The document about “our peace testimony” frequently invokes the name of Christ and the words and stories of the Gospels, but while I sometimes employ language and imagery drawn from Christianity and other religions to express the moral seriousness of causes like peace, I don’t see any reason why humans’ desire to keep other humans from needlessly dying should be limited to those who believe in a man in the sky (and my own approximation of God certainly isn’t that) or his son here on Earth. Yet we who doubt have something to learn from the religious, perhaps particularly the Society of Friends, and how they throughout history have found the courage to say and do extraordinary and righteous things. This week Britain and other countries in Europe are commemorating the centenary of the start of World War I: an occasion, I fear, for much jingoism and glorification of war at the expense of its grim and bloody realities, some civilian knowledge of what we actually ask our young men and women to endure, and any serious consideration of the causes—or lack thereof—for which the wars of the past century have been and are today being fought. When I first came to Britain I was appalled by the extent to which Remembrance Day, even and especially in churches, is observed as a way to celebrate the ongoing practice of war and the empty flag-waving patriotism that so often accompanies it, while prayers for peace fade out of earshot. Thereafter I pledged to don the white poppy for Remembrance Day in mourning for soldiers and civilians who have died in war, remembrance of conscientious objectors and others who hold different points of view about war, and forward-thinking commitment to peace. When I started evangelizing about the white poppy as an alternative to the standard red lapel poppy, which has become Britain’s patriotism-litmus-test answer to the American flag pin, I was astonished all over again by the fear with which my friends who professed agreement with my reasons for wearing the white poppy hesitated to wear it themselves, lest they be publicly perceived to be committing that ultimate sin of being unpatriotic. But the thing is, it starts with us. 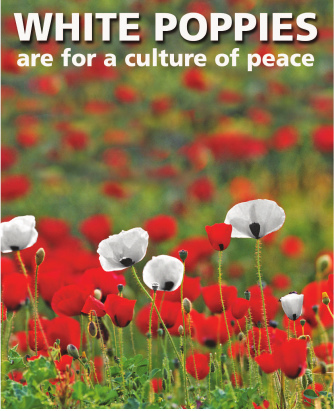 It starts with white poppies, with our voices and with the courage of our convictions. A Friend called Kenneth Barnes is quoted in the “peace testimony” document as saying that “Conscientious objection is not a total repudiation of force; it is a refusal to surrender moral responsibility for one’s action.” As Jews around the world complicit in Israel’s perpetration of persecution, or as citizens of countries who remember wars as their finest hours and pledge again and again in words and in hard currency to repeat them, we need to remain committed to peace, and to the hard work of mediation and reconciliation. Regardless of what our sacred texts may or may not tell us, we are morally obligated to answer for what our countries and our peoples do in our names. And we are morally obligated to meditate long and hard upon what it is that we in particular can do, in terms of money, time, words, and so on, to amplify the voice of peace in response to world conflict and to militaristic nationalist sentiments at home—before it’s too late. I was ultimately left unsatisfied by the lack of immediacy of the Christian prayers for peace I found on the internet, and by their lack of applicability to non-believers as well. So, this Sunday evening, in my own words, I pray—which is to say I hope and I cry, and I strive to translate my hope and crying into action—for peace throughout the war-torn regions of the world, most especially Gaza; for our politicians to make decisions that stand for the safety and flourishing of civilians and not for warmongering and power-grabbing; for those who are commemorating Europe’s century-old declarations of war to do so in the spirit of sorrow and solemn remembrance, not in the spirit of jingoism and glory; and finally and most importantly that we may all have the courage of our convictions to speak out against violence in all times and places, even when it may involve great difficulty and personal cost. In all our names, amen. This entry was posted in Blog, Ethics on 3 August 2014 by Emily.